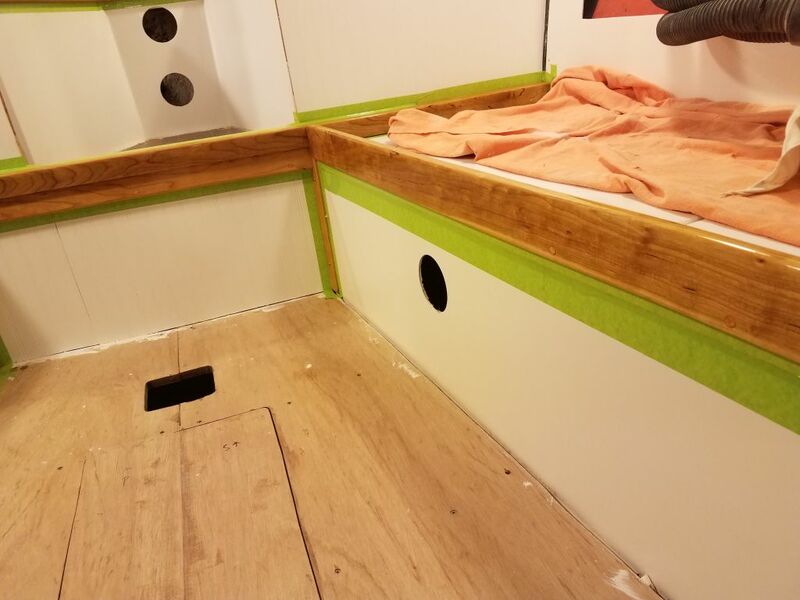 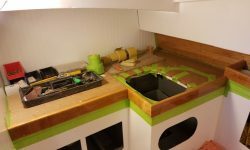 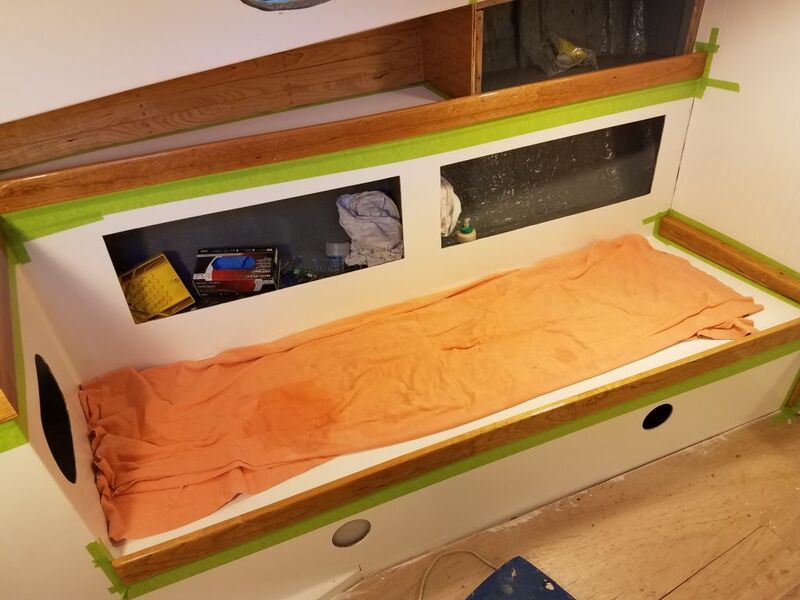 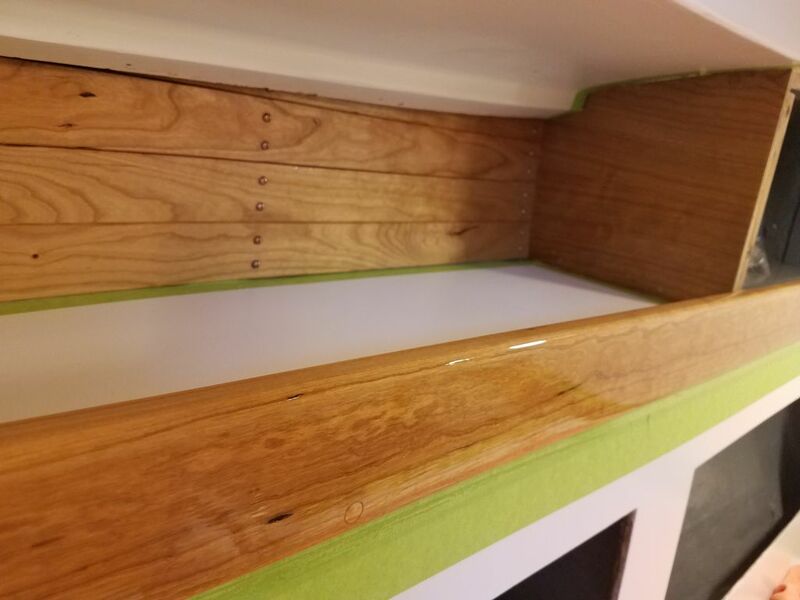 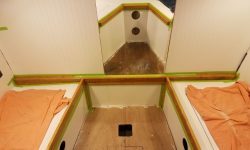 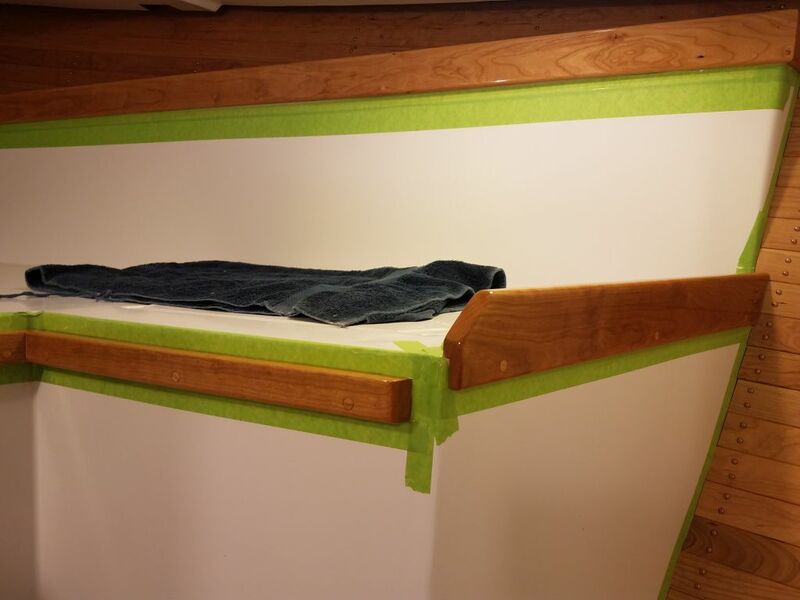 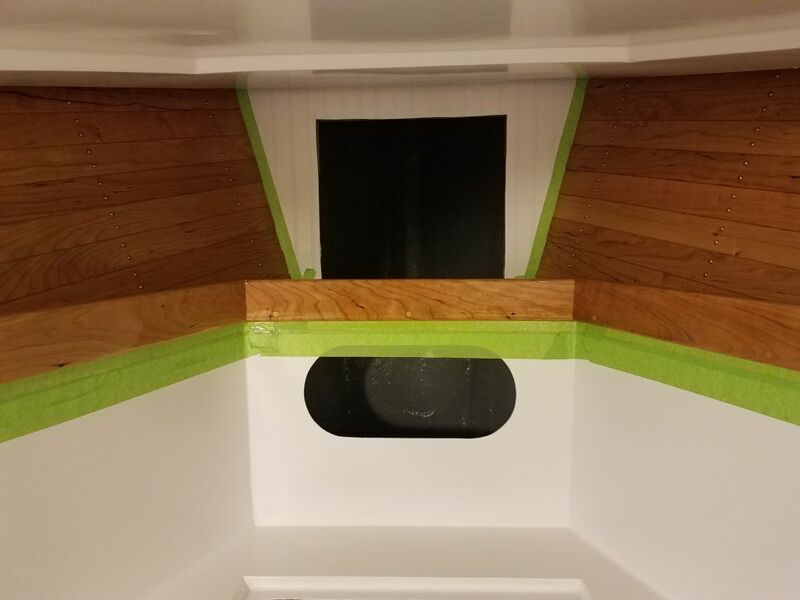 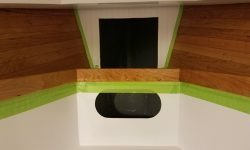 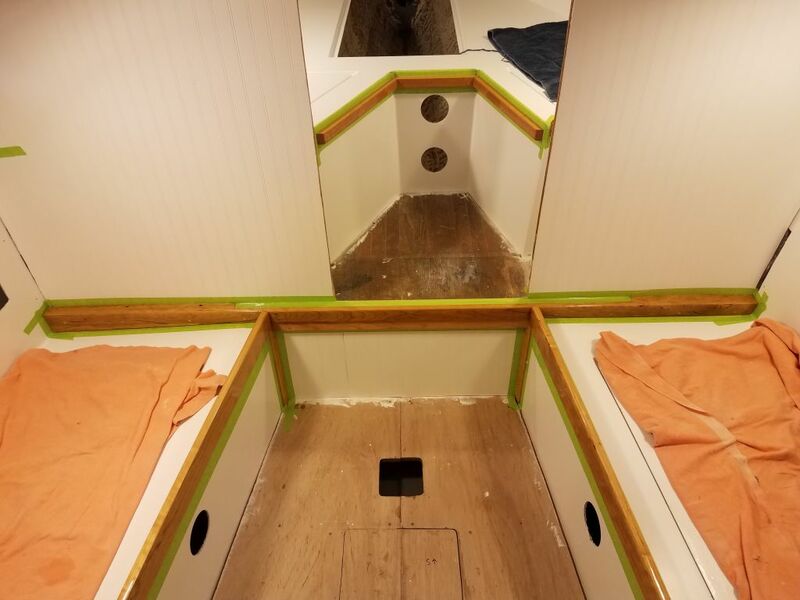 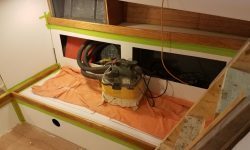 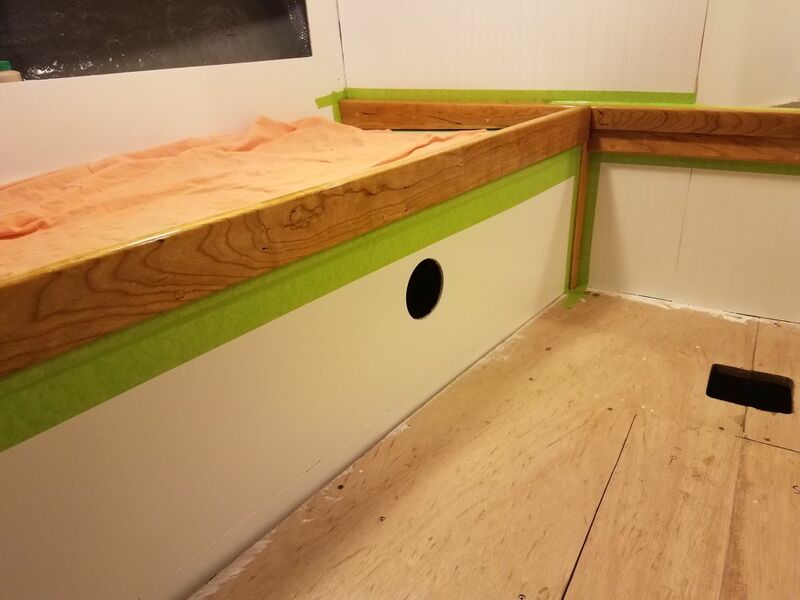 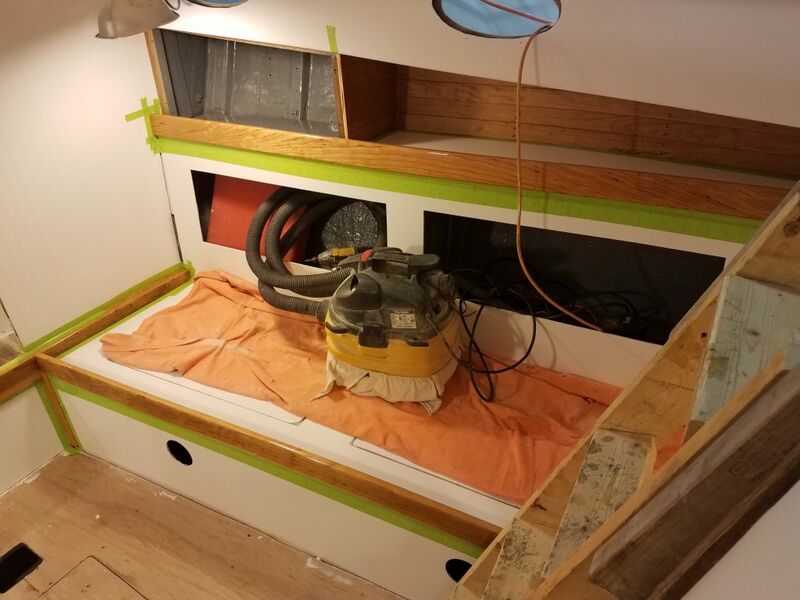 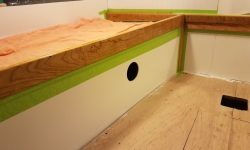 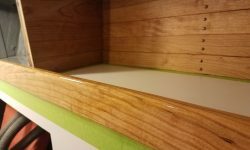 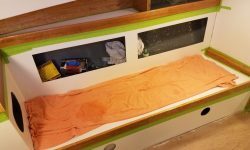 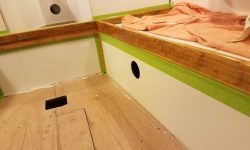 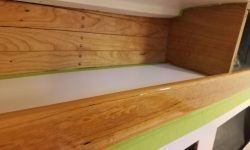 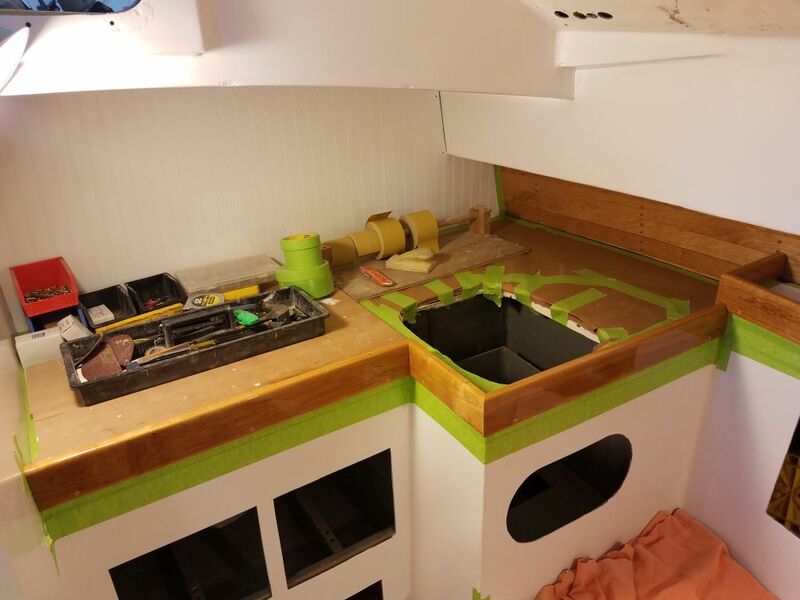 With another limited day available, I focused first on the interior trim varnish, with another round of sanding to prepare for the fourth coat of gloss base varnish on all areas. 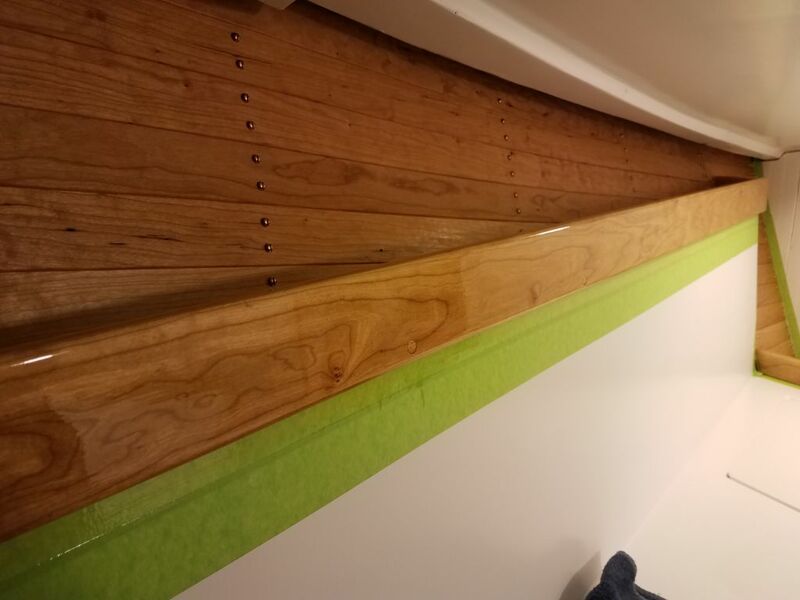 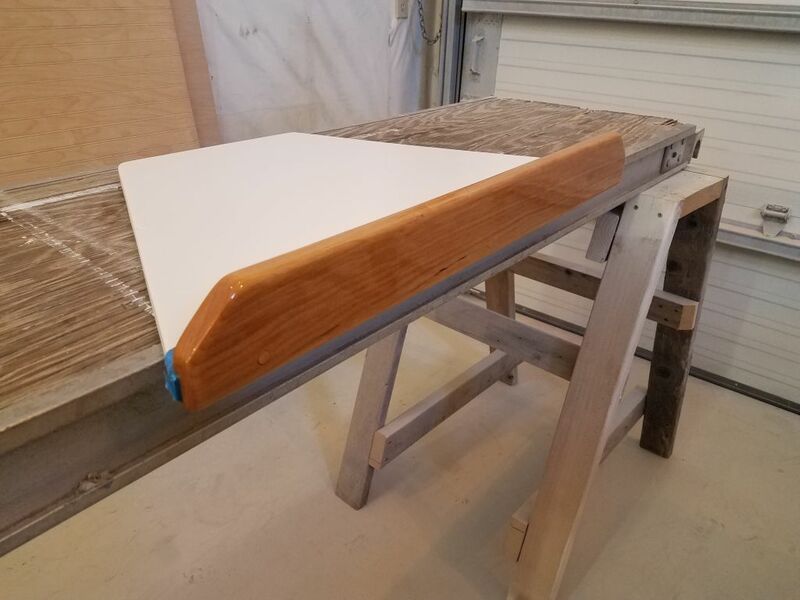 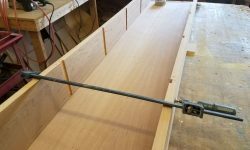 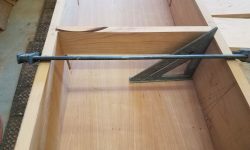 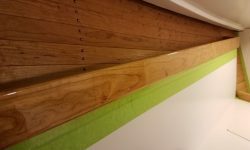 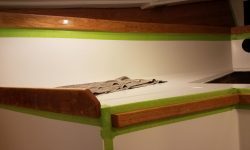 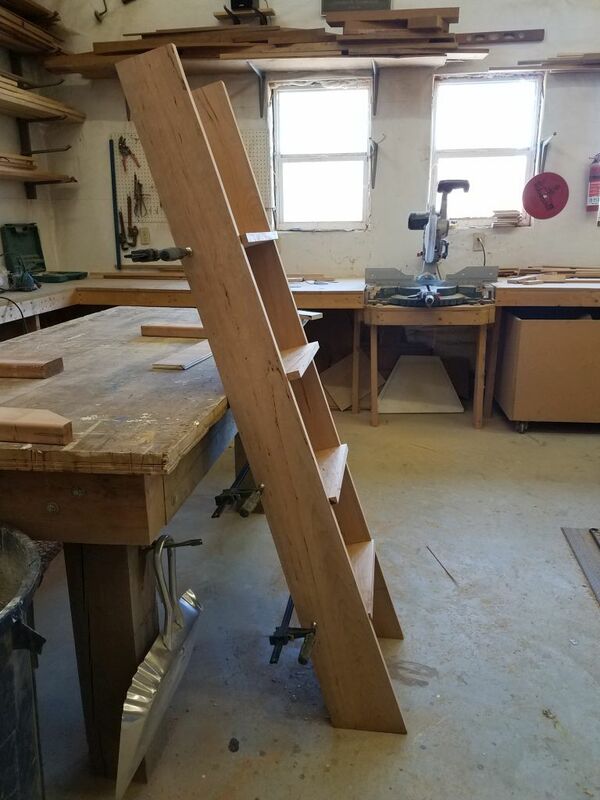 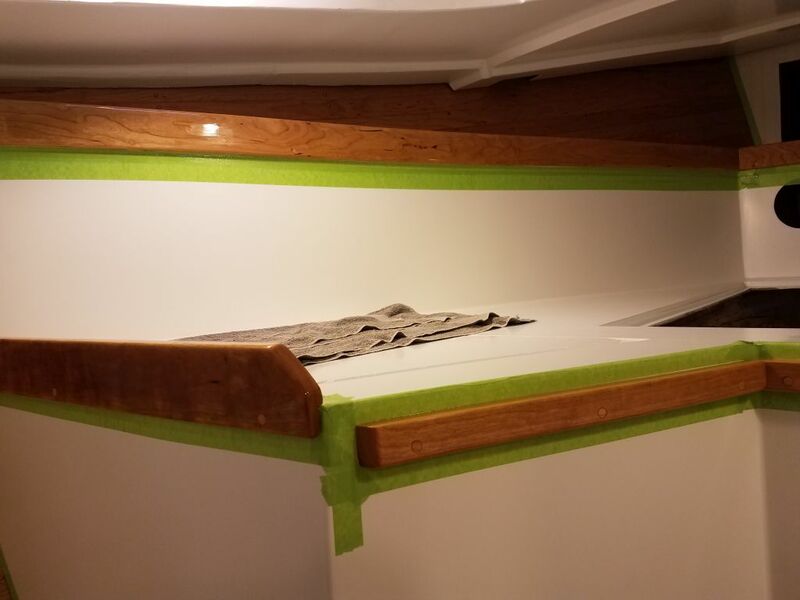 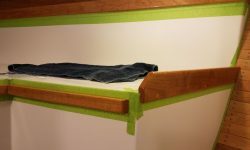 I was ready to commit to the ladder treads on the new companionway ladder, but before making the dado cuts in the side rails to accept the eventual treads, I used some scrap to simulate the tread at the angle I’d chosen, which was 90° to the back edge of the side rails and gave the treads a backwards angle for better grip. 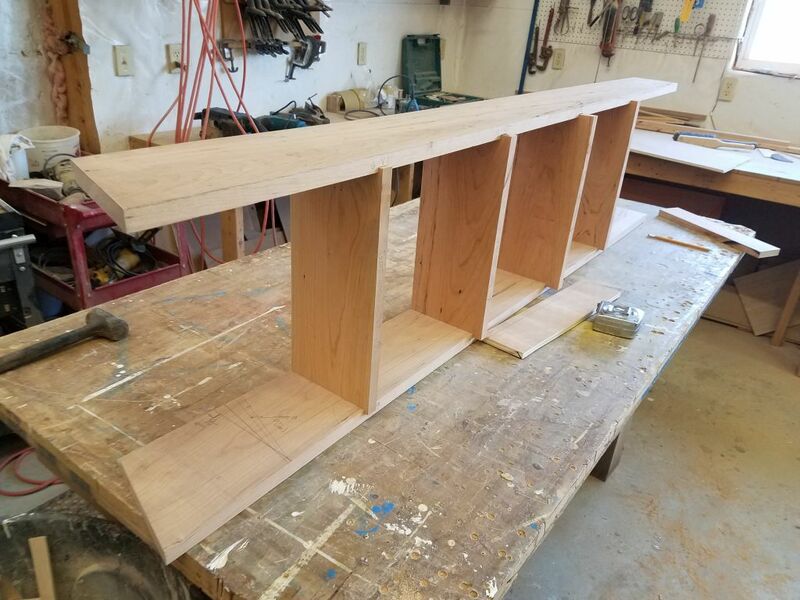 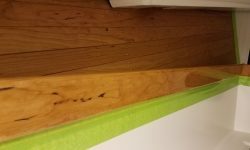 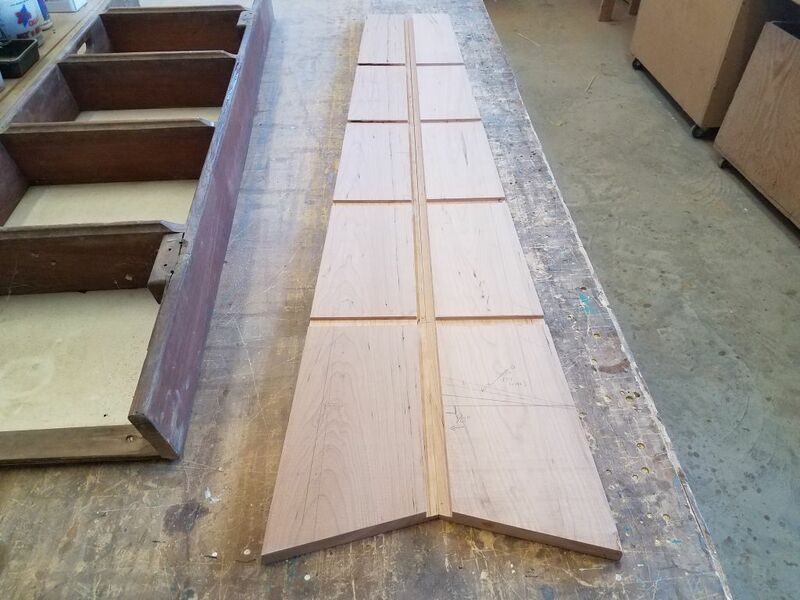 Satisfied with the visuals, I committed and set up the table saw with a 3/4″ dado cutter and, after some testing on scrap to get the depth where I wanted it, carefully made the eight cuts required (four on each side). 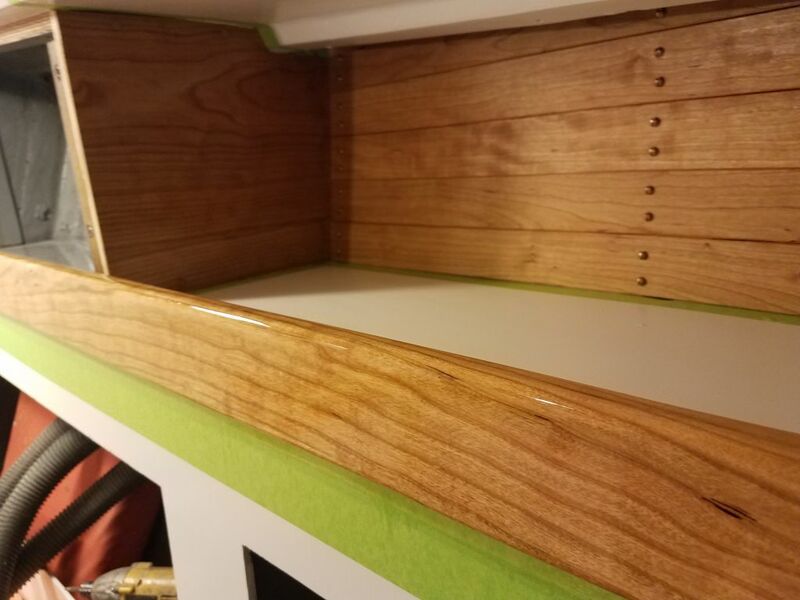 Next, I clamped up the side rails with the plywood back so I could work on the treads. 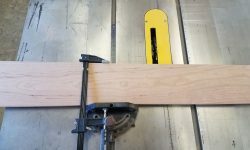 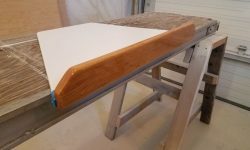 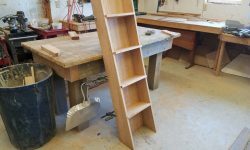 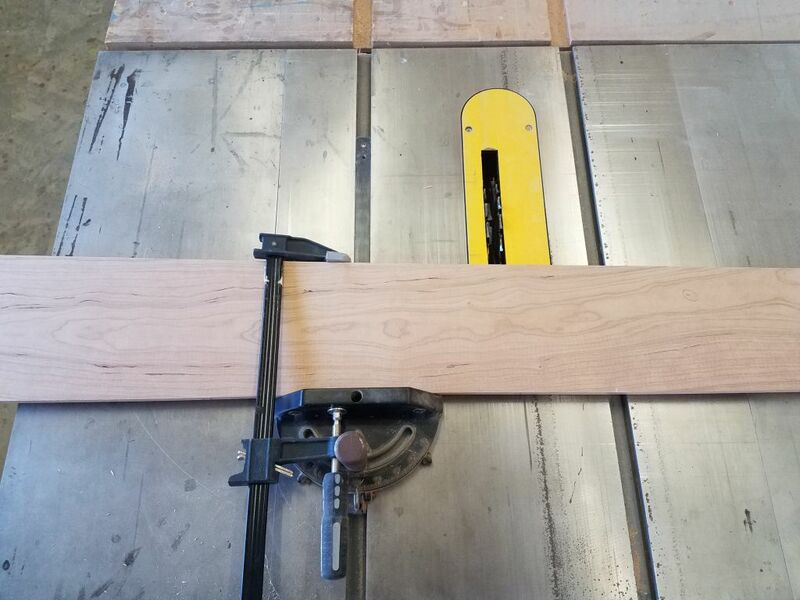 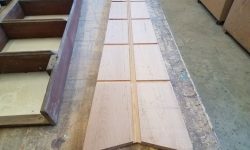 I selected some boards from which to cut the blanks for the treads, and milled four blanks into slightly over-length and over-width pieces for the task. 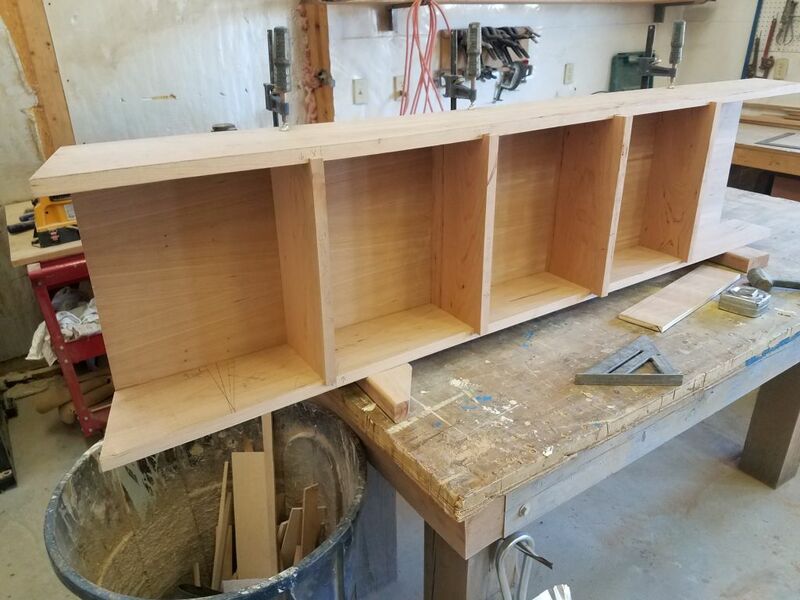 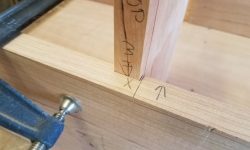 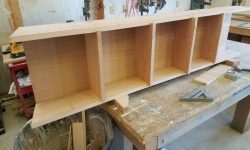 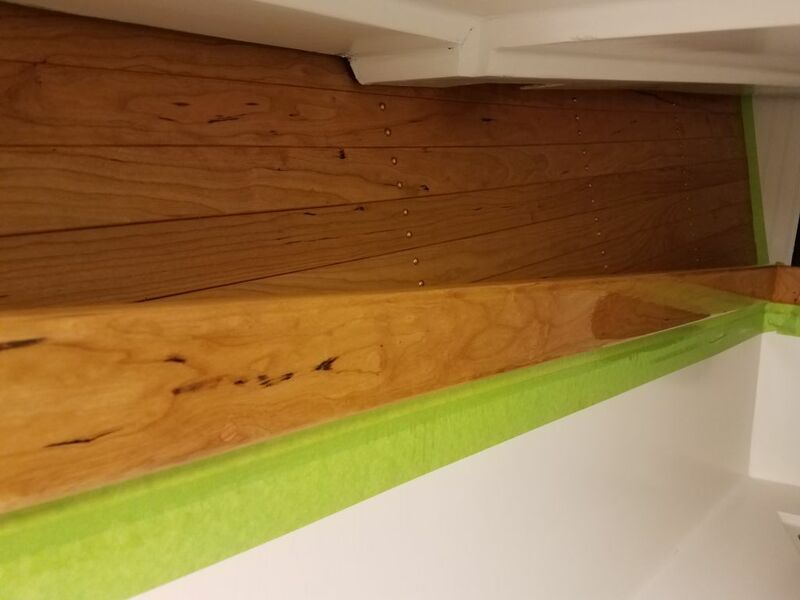 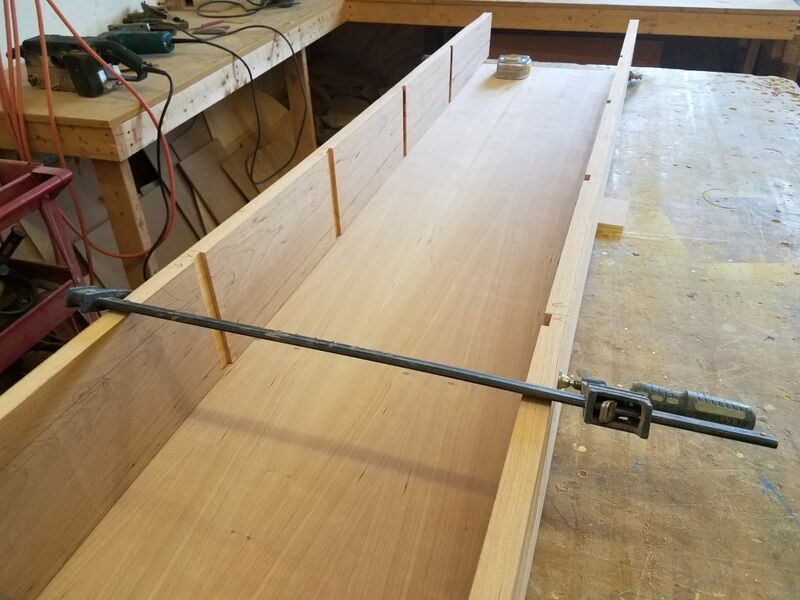 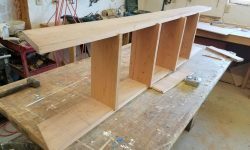 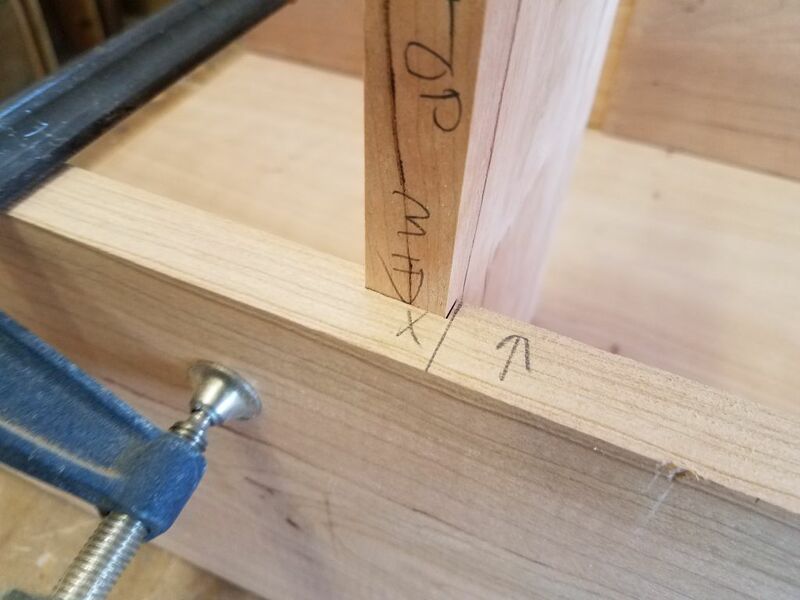 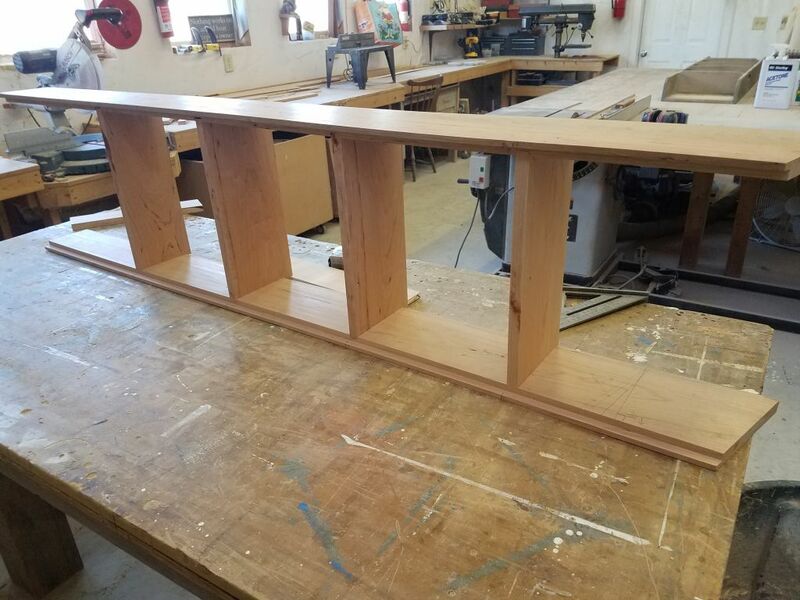 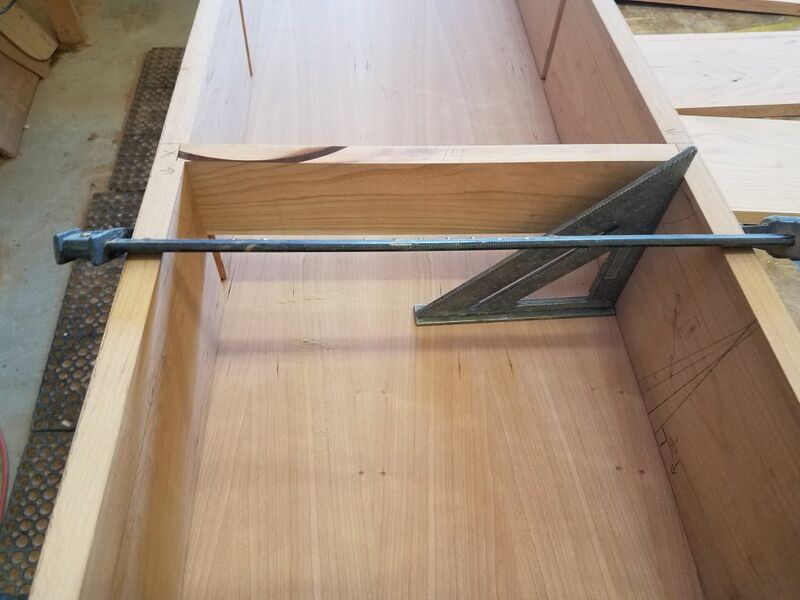 The stock itself was a bit thicker than 3/4″ (the thickness of my slots in the side rails), so I planed them all down to the proper dimension to fit snugly. 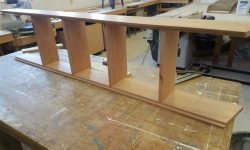 I used a scrap of the same material to determine the proper length to fit between the rails and in the slots. 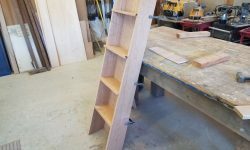 Having determined the correct length, I cut all the blanks as needed and fit them in place, clamping up the assembly dry to check the fit and overall appearance of the new ladder. 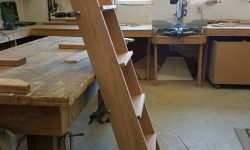 The treads were still deeper than necessary, which I’d intended so I could mark and trim them accordingly. 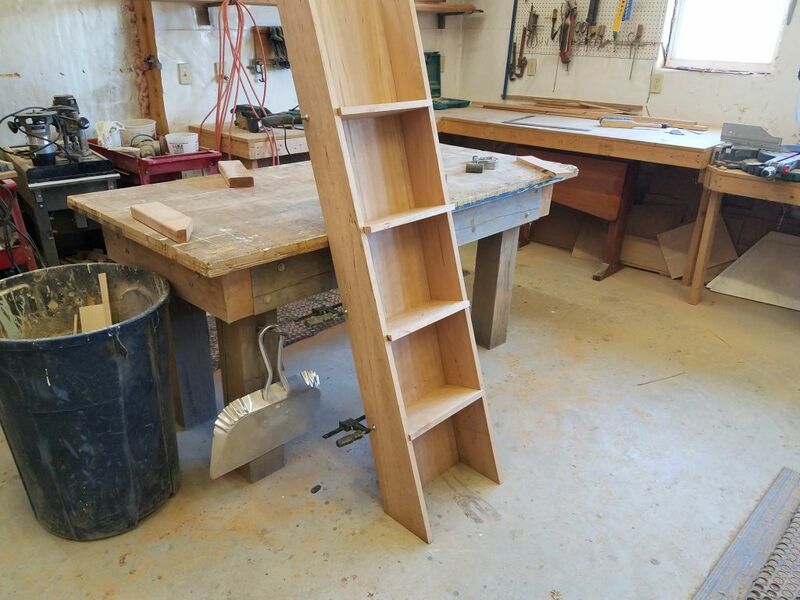 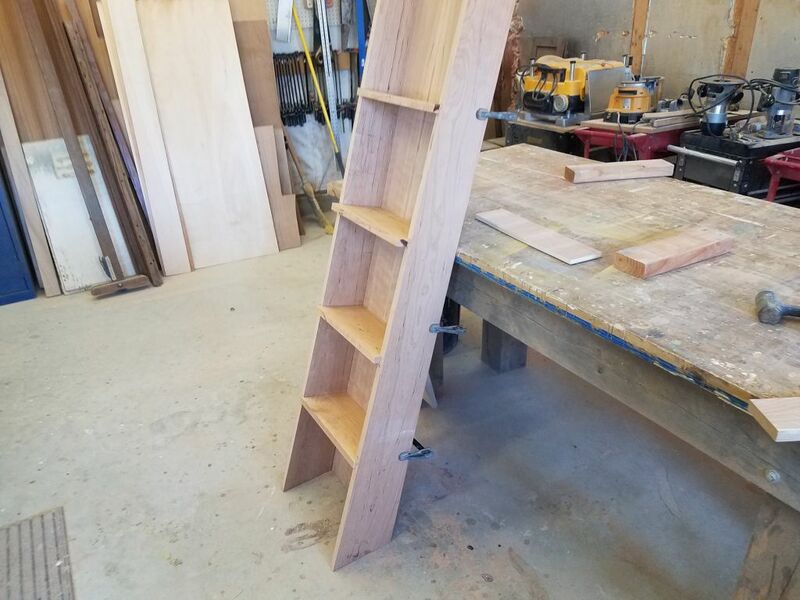 For the moment, I was out of time, but I marked the treads where they extended beyond the sides of the ladder, and would soon trim them and finish up related steps so I could think about assembling the ladder for good.